Your CRM and your marketing automation system are very powerful tools, and their sum is greater than the parts if they are properly integrated and leveraged. As sales and marketing organizations and their systems have become more closely aligned, more opportunities have arisen for businesses to leverage both systems: lead scoring dashboards, marketing campaign attribution and reporting, and other advanced capabilities that deliver insight into the digital body language of your prospects and customers. Yet keeping these complex systems maintained and properly integrated is challenging for many, due to limited in-house resources or lack of best practice expertise and experience. At DemandGen, we’ve worked on thousands of marketing automation and CRM projects, so our integration consultants know how to design closed-loop solutions that help revenue marketers track campaign attribution, manage and score leads along their lifecycle, keep data in sync, provide increased sales visibility and enablement, and manage the demand funnel “from click to close”—dramatically ramping up return on marketing investment. 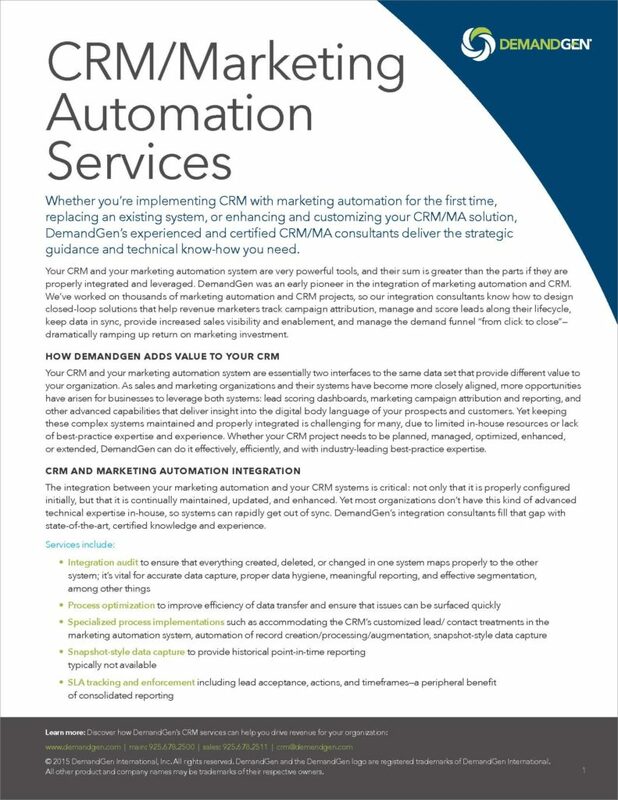 If you’re looking at enhancing your CRM and marketing automation solutions with advanced capabilities, download our CRM and Marketing Automation data sheet. Learn more about our CRM/Marketing Automation services or contact a DemandGen expert.